Originally EclEmma was inspired by and technically based on the great EMMA library developed by Vlad Roubtsov. The update site for EclEmma is http://update.eclemma.org/. EclEmma is also available via the Eclipse Marketplace Client, simply search for "EclEmma". Coverage overview: The Coverage view lists coverage summaries for your Java projects, allowing drill-down to method level. 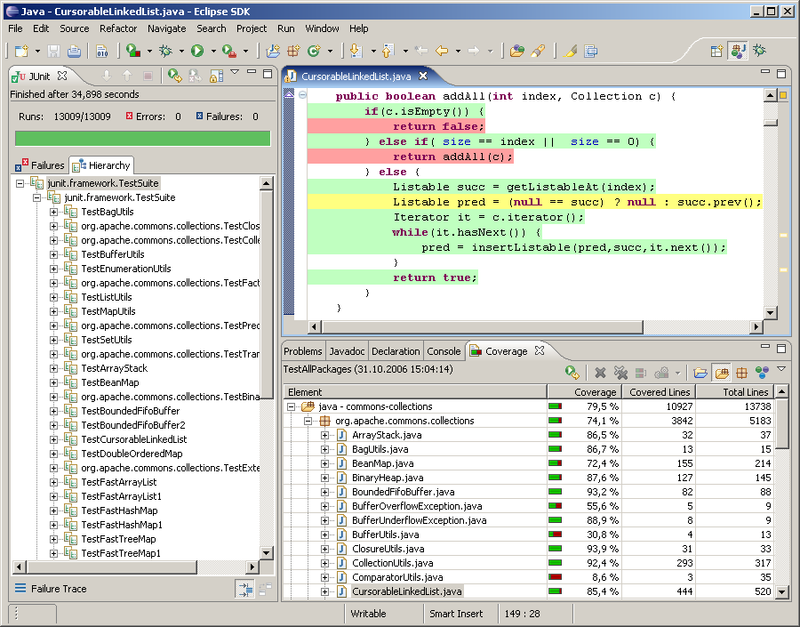 Source highlighting: The result of a coverage session is also directly visible in the Java source editors. A customizable color code highlights fully, partly and not covered lines. This works for your own source code as well as for source attached to instrumented external libraries. Different counters: Select whether instructions, branches, lines, methods, types or cyclomatic complexity should be summarized. Multiple coverage sessions: Switching between coverage data from multiple sessions is possible. Merge Sessions: If multiple different test runs should be considered for analysis coverage sessions can easily be merged. Execution data import: A wizard allows to import JaCoCo *.exec execution data files from external launches. Coverage report export: Coverage data can be exported in HTML, XML or CSV format or as JaCoCo execution data files (*.exec).